Use the functions of your chair as much as possible - It's what they're there for! Bisley are world famous for their quality steel storage products. 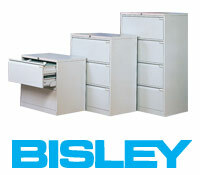 Bisley specialise in filling cabinets of all sorts. The Euro Tambours are great space savers as the doors roll back to reveal the storage behind. Bisley traditional filling cabinets have fully extending drawers. This gives greater capacity and total access to contents. Every Bisley 4 drawers hold 2.22m of filling. The filing cabinets come with Anti tilt, which allows only one drawer to be opened at any time. Tough paint finish (Conforms to B53900). Progressive action with smooth roller ball bearing glides. One carcase for strength. Bisley’s quality and strength have been their trademark for a generation.